Information on the notification emails field in the settings page of your profile. The purpose of the Notification Emails field is to provide an email address that will receive Pickup and Delivery notification emails for every load that has been picked up and delivered by your company. 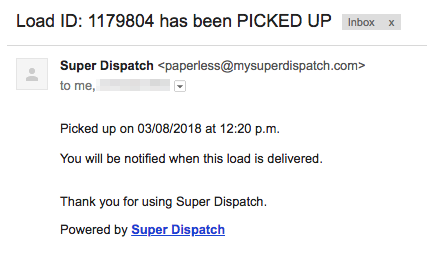 The email will come from Super Dispatch and will contain Load ID with the date/time information. You can put multiple recipient emails by separating with comma. Feel free to ask questions by clicking on the orange chat icon on the right corner of your screen.